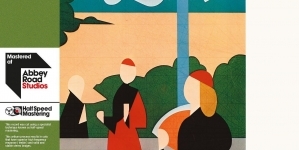 Four of Eno’s most seminal ambient recordings have been remastered for vinyl. As he entered 1975, Brian Eno was one of the most exciting artists in rock, an increasingly ambitious composer whose knotty art-pop was already laying the foundation for some of the most exciting music that would emerge at the end of the decade as punk morphed into some new paradigm of open-access pop. One January morning, however, Eno was crossing a street when he was struck by a cab, inflicting a major head injury and leaving him bed-ridden for weeks. As he convalesced, his girlfriend put a record of harp music on a turntable with a broken speaker, leaving the faint, warped sound of music to mingle with the sound of rain outside. The strange experience of this profoundly affected Eno, who would use it as the basis for a new kind of music that would marry the ethos of minimalist classical music with emergent synthesizer and production technology to found a new genre. Following from last year’s reissues of Eno’s classic pop albums, four of his most seminal ambient recordings have been remastered for vinyl, reintroducing their calming pleasures to a world that long ago absorbed their stealthy ambition. 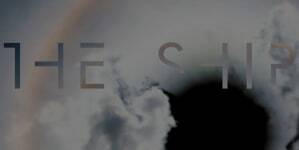 Discreet Music, the first of Eno’s post-recovery ambient releases, is the logical progression of the artist’s work with King Crimson guitarist Robert Fripp. The half-hour title track was, in fact, originally intended as background loops for Fripp, and the album’s liner notes depicted the composition as a hardware schematic, diagramming out how synthesizers, tape decks and feedback were arranged to create a work of sustained notes that nonetheless undulate just enough to be in constant motion. The gently oscillating synth clusters are transportive, but per Eno’s own formulation of ambient music as something that can be either put on in the background or worthy of close study, the track ends up drifting so far from its initial notes that what is broadly an experiment in hardware sequencing becomes a new form of composition. As if to double down on this method as a viable form of composition, the album’s second side is devoted to three variations on Johann Pachelbel’s Canon in D Major arranged by avant-garde composer and free jazz legend Gavin Bryars, who wrote out and encouraged his ensemble to improvise looping patterns similar to Eno’s studio-driven patterns. 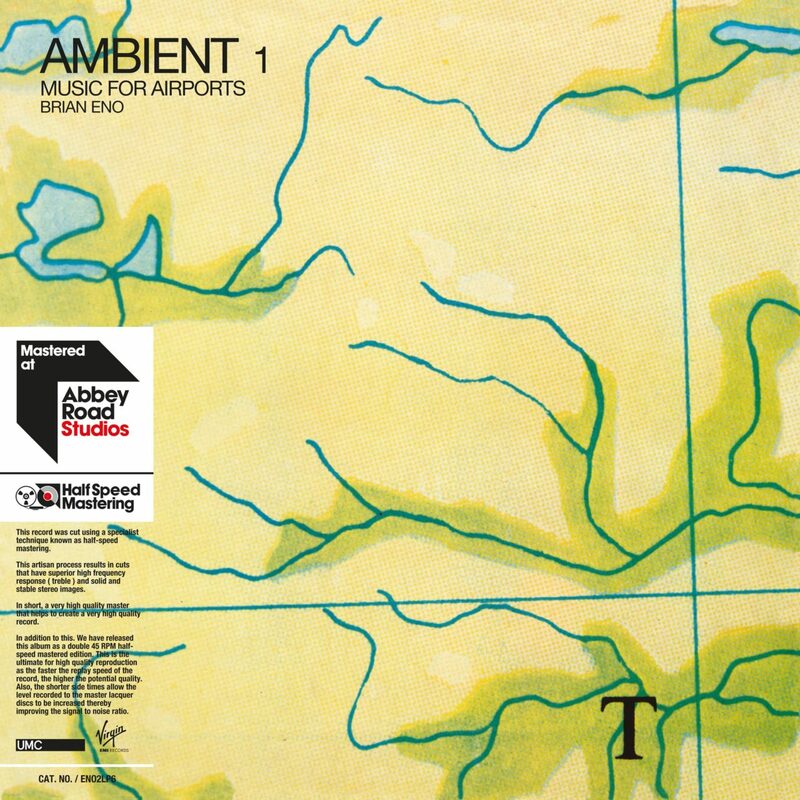 From this auspicious beginning would follow Eno’s codification of this new sound into his ambient series, the first of which, Music for Airports, remains arguably his most well-known solo album. As the title indicates, Eno imagined the record as a response to the stressful din of airport noise and clashing Muzak, and he delivers an album of Erik Satie-esque minimalist études that layer sounds into pulses of noise that elegantly crest and ebb like waves. “1/1” uses brittle, plinking piano notes as the guideposts for more abstract synthesized tones that waft in and out of earshot. It is one of the most soothing works in pop history, and despite lasting nearly an entire vinyl side it is so compelling it could last forever without losing its atmosphere. The rest of the album incorporates vocal loops into various permutations of synthesizer- and piano-led sequencing, culminating in the surprisingly complex closer, “2/2,” which incorporates synths that approximate the sounds of brass instruments to give the blurts and moans of noise the feeling of an orchestra. 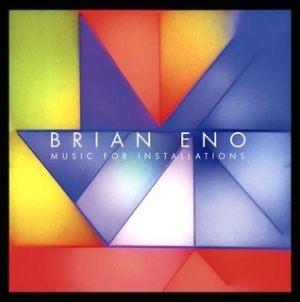 Not part of Eno’s Ambient Series but clearly cut from the same cloth, Music for Films finds Eno extrapolating his composer-like approach to ambient to actual arrangement for other musicians. Calling on prog luminaries like Phil Collins and Fred Frith along with jazzbos like Percy Jones, Eno crafted brief motifs for “imaginary” films, sketching out loose-limbed themes for movies that never were. 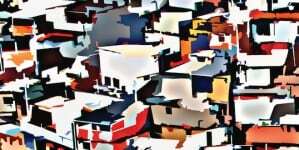 As such, there is a clearer structure to these tracks than the more distended tones of the previous two ambient releases. 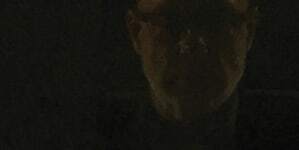 Robert Fripp’s guest guitar on “Slow Water” stacks on different lines of bell-like chimes with distant, sustained stabs of Fripp’s trademark laser-pointed sound, while “Events in Dense Fog” is just bright enough to mask the ominous cascade of its twinkling organ notes that slice through howling synths like cold rain. “Inland Sea,” with its warbling percolation, sounds like the soundtrack to a 16-bit JRPG 15 years ahead of the fact, and in general Eno’s preference throughout for trebly, soaring notes of relief set against groaning bass chords sounds like preemptive work for nascent video game technology than the legitimate film scores he would soon begin to compose. That album’s brightness is all but absent in On Land, the fourth and final installment of Eno’s original ambient run. More reliant upon natural sounds and recorded objects than synthesizers, the album reflects several years of Eno’s developments in the studio on both his own output and that of collaborators like David Bowie and Talking Heads. 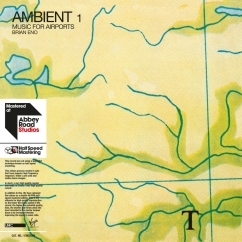 Where the other albums created elegant, transportive soundscapes, here Eno treads in darker terrain; opener “Lizard Point” is driven by the sound of howling wind and synth notes that are sustained until they fade into the vanishing point, all as the plops of water dropping from cave stalactites add to a sense of isolation. “Shadow” is pure dissonance, insect-song synths buzzing and whining around gurgling, string-bending bass and wordless vocals that sound like an adult playing at inane child babble. That Eno titled the record On Land is a helpful guide to what he was aiming for, as the music often sounds like a ship lost at sea. This music may be on firmer footing, but it nonetheless explores realms cloaked in thick fog. Though Eno would continue to explore ambient music in relation to constant technological advancements over the last few decades, On Land remains possibly his most unified ambient statement, his most vividly felt sketch of unknown terrain he has continued to map to this day. A work of music that challenges and soothes, engrosses and sedates. Eno continues to explore the unlimited possibilities.